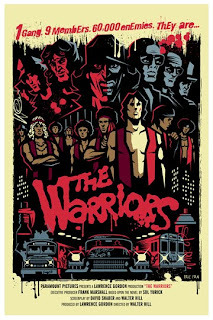 I was fortunate enough to get asked by the guys at Mondo to create my very own 'The Warriors' poster. It was a blast to go back and rewatch this cult classic several times. It's definitely late 70's in look and feel, but the story, action, and excitement hold up pretty damn well! It's that rare throwback that was working on all cylinders and strands the test of time. I don't think a better street gang movie has since been made. Although 'Menace II Society' was pretty bangin' in its own right. The poster itself is HUGE at 24" by 36", and at an affordable 30 bucks, hopefully a few of these things will move so I can get asked to do another cult classic poster such as my personal fave 'Born in East L.A.'! 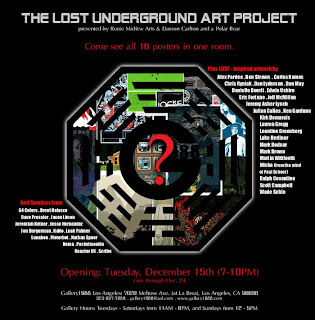 If you're around the greater Los Angeles area between Tuesday, December 15th and Christmas Eve, be sure to check out the Lost Underground Show at Gallery1988 . All 16 Lost posters will be on display as well as a bunch of Lost-inspired paintings and drawings. I was fortunate enough to get to be one of the lucky 16 artists chosen to create a poster and as a HUGE fan of the show, the pressure was on to do something that captured all my die-hard fanboy excitement. I never thought the poster series would reach this amount of sold-out-in-seconds craziness and get me into the Entertainment Weekly with Sandra Bullock's lovely mug on the cover. Nutso! It's been an insane ride and it's gonna be even cooler to see them all under one roof. I hear there's already a line in front of the gallery...and it's 24 hours away! I'll hope to see you behind that hatch, Lost in a sea of fans just like me!